Rising from the ashes of war with the help of overseas aid and transforming itself from a recipient to a donor country in nearly half a century, South Korea presents a leading example of how development aid can help lift a country out of poverty. South Korea is on the right track toward sharing its experience as a development success, but there is still room for improvement to boost the effectiveness of its aid programs, said the chief of the Organization for Economic Cooperation and Development’s Development Assistance Committee. 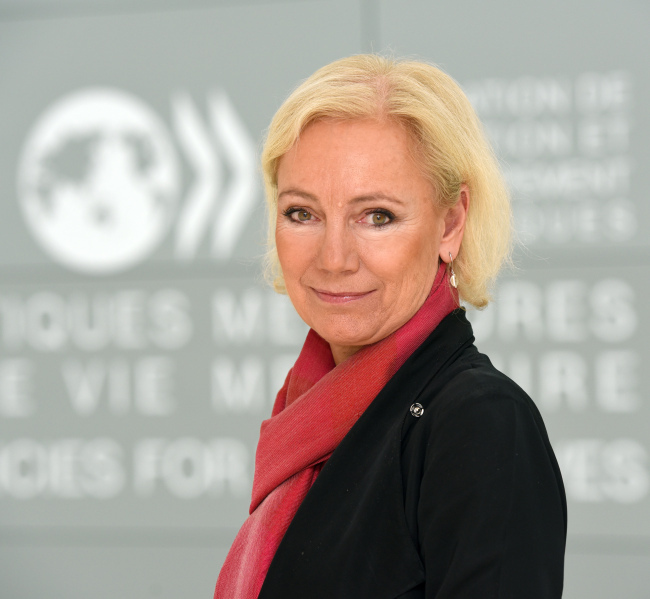 “Korea’s ODA should be more coherent across different parts of the government and the overall program should be more coordinated,” Charlotte Petri Gornitzka said in an interview with The Korea Herald last week. Appointed as DAC chair in 2016, she was in Seoul to participate in the meeting to mark the publication of the 2018 DAC Peer Review on Korea. Some of the most pressing challenges undermining the country’s effective development cooperation were a lack of comprehensive strategy, complex systems with a bureaucratic, lengthy budget approval process and increasing fragmentation arising from multiple agencies involved in delivering Korea’s ODA, according to the DAC Review. In South Korea, the Committee for International Development Cooperation under the prime minister serves as a control tower for development activities across the government, formulating policies and directing all ministries and agencies conducting ODA programs. Largely, the Finance Ministry and Foreign Affairs Ministry are in charge of offering loans and grants, respectively. On the field, Korea’s multiple implementing agencies and fragmented aid have caused confusion at home and in recipient countries, leading to calls for a single channel for Korea’s development aid. Some even demand the government create one agency to carry out all ODA programs to better coordinate loan and grant portfolios, as well as between different ministries. The number of organizations issuing grants increased from 44 in 2013 to 64 in 2015, while the size of the project budget diminished, according to the DAC Review. “We don’t recommend how many agencies South Korea should have. But in principle, the more you divide, the more you need to put an emphasis on better coordination,” she said. Another challenge for South Korea is to continue to increase its ODA budget, she added. Despite a steady rise in the amount of its ODA, the country’s $2.25 billion provided in ODA in 2016 accounts for only 0.16 percent of gross national income, making it the 26th-largest provider of 29 member countries by percentage of GNI. It aims to allocate 0.3 percent of gross national income as ODA by 2030. Gornitzka, former director-general of the Swedish International Development Cooperation Agency and secretary-general and CEO of Save the Children’s Sweden Office, agrees that aid alone cannot be a solution to combating poverty around the globe, but it can be a catalyst in expanding financial flows and finding solutions. “I think that a combination of good governance, sound economic policies and the effective use of aid with much investment in health and education made South Korea (turn itself from an aid recipient into a donor),” she said. In the face of growing pursuit of national interests and pervasive doubts that international aid hasn’t been effective in supporting poor countries’ development, she said that South Korea shows how aid can bring a tangible result and its experience should be made more “visible” to others.